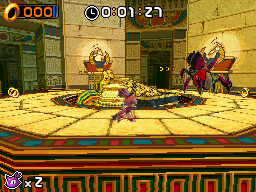 The Egg Scarab is the third boss fight in both Sonic and Blaze's stories in Sonic Rush for the Nintendo DS. Inside a vast chamber within the ancient, Egyptian-style ruins of Mirage Road, the heroes face off against Dr. Robotnik or Dr. Nega, who control this towering mechanical scarab beetle and its spiky, spherical cargo. The fight takes place on a circular arena with the screen following the player as they move. Eggman's scarab beetle perches on the ring as well, and will pursue Sonic or Blaze, rolling its alternately-spherical-then-spiky ball ahead of it. This boss cannot be damaged conventionally via spin attacks; instead one has to turn its own attacks against it. The most frequent attack sees the beetle cease its pursuit and instead roll the giant sphere towards you. The ball shifts between a spiked death-dealer and a (slightly less painful) plain sphere as it rolls. In each case, if it hits you it will knock out your rings; however, if you spin jump the ball while it's not spiked, it will be sent rolling back towards Eggman. This is how you can damage the boss, although you must be careful to wait until after the scarab has turned itself round before reflecting the ball back to it in order to deal a hit (otherwise, it simply catches the sphere again in its pincers). As the damage builds up, the robot starts jumping over the ball when it's about to hit it in the back; you have to reflect it a second time to connect. The beetle also occasionally flies up to hover above the center of the ring, and fires exploding spike-balls at the player. When the boss still has most of its hits left, these can be avoided with no more effort than running full tilt in one direction until the scarab returns to the ground. However, later in the boss Eggman gets tricky and begins to fire not where you are, but where you are going to be. So keep your wits about you and swerve wildly!